If anyone is interested in the dishtowel hanging on the branch towel bar, it is from the company that I design for, tag (trade associates group) Just thought I would let you know. 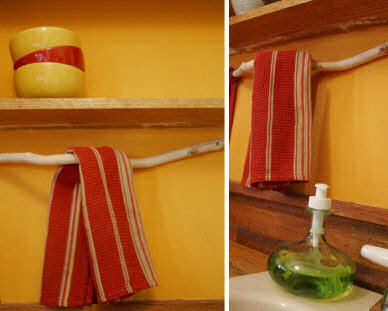 That branch “towel bar” is just so fun. Great post! I like her color palette too. love it. It brings such a “natural” feeling indoors. where did the amazing soap bottle come from?!?! Bottle ($1.99 I believe) came from hardware store in Hell’s Kitchen, on the corner of 52nd and 9th Ave. I try to keep an eye out for amazing “none design” items at bodegas.